A fading movie star with a sense of emptiness, and a neglected young wife meet as strangers in Tokyo and form an unlikely bond. 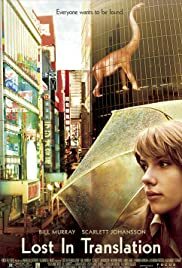 BEFORE: I’m very excited to see today’s film, Lost in Translation because I’ve heard many positive and negative things about it so I’m not sure how it will turn out. It’s entertaining and refreshing in a way to watch these characters unfold. And it really is about the characters and not the story. When I said there was no drama I wasn’t kidding; there really isn’t much plot going on. For a while, it’s intriguing and you want to keep watching to see what will happen to these characters next. But that interest slowly fades away as the film progresses. No longer is it fresh and original; it’s boring and repetitive. There isn’t the same energy you fell towards the characters in the beginning. Perhaps it’s because there isn’t a real story, or perhaps it’s because the characters really aren’t that interesting. I’m not sure which it is. What I do know is it was still fun to watch and despite my criticism, it’s worth it to at least give the film a chance.